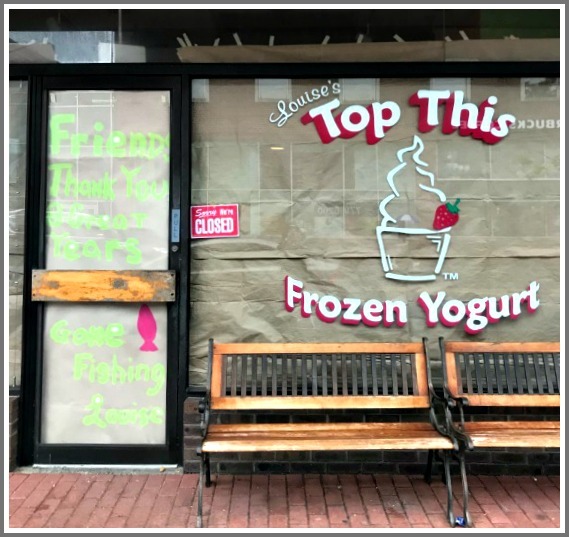 Westport’s once-plentiful frozen yogurt shops are melting away. It lasted longer than many similar stores. And Louise had plenty of devoted fans. No word on what’s next. This entry was posted in Downtown, Local business and tagged frozen yogurt, Louise's Top This. Bookmark the permalink. I am so sad that Top This has closed! This is sad news — but not surprising. Between the excessively high rents and the number of large, corporate chain stores coming to town, it’s not easy for a local business to thrive. I’d love to see more folks in our community commit to support local shops. 8 years ago the town was very different. I doubt we’ll see many more local entrepreneurs enter the Westport market. My son will be so disappointed!! Ice cream shops haven’t done any better — think Haagen Dazs, Ben & Jerry’s and Baskin Robbins. Is kind of sad to see it go , due to a local friend of mine worked there .. Yet it was Once a Booming Place with long lines out the door , during the warmer months …. Everyone please go to Christie’s to support them! We don’t want them to end up like this either. alas where is The Country’s Best Yogurt ???!!! Louise went to California to visit her daughter in college and became familiar with the yogurt bar concept. She was the first one to bring the frozen yogurt bar to Westport. Her store was always spotless and she refilled the machines instantly. It’s sad to see her business close. In the winter she made grilled cheese sandwiches and soup. Her crepes were delicious. Good luck Louise in your new ventures, whatever they may be!